Seriously, how awesome was New Zealand? 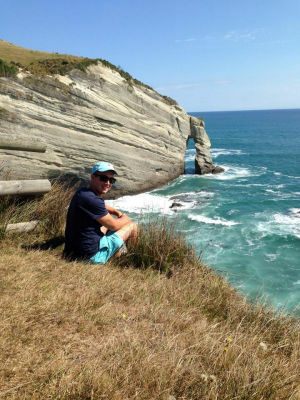 Davin: I loved New Zealand so much that it kind of became my home away from home! Culturally, it was not a huge shocker so I fitted in easily with New Zealanders. They are very welcoming. Can you describe what an Arrival Pack do in your own words? 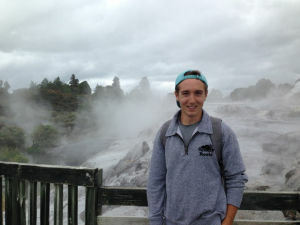 Davin: It is simply the biggest stress reliever when arriving in New Zealand. They do all the work for you but walk you through it all, so you get the knowledge to do it again later in another country, for example. What was the best thing theyr did for you? Davin: Everything really! The most helpful was to have everything put together on arrival, from the shuttle to the hostel to meeting you right at the hostel. I did not need to bother searching for all this myself. Tell me about one place that you really loved? Davin: I loved Nelson as a whole. I worked and lived there for a while and met a lot of great people. I met some great friends to chill out with, go to the beach with, and live with. What is the most memorable activity that you did in New Zealand? Davin: It was definitely camping down the West Coast with some friends that I met while I was working in Nelson. What jobs did you do while in New Zealand? Davin: My first job was as a sales associate in a toy store in Nelson. It was great around Christmas as we were really busy, but as predicted, it died off afterwards. I also worked in a brewery/cafe as a bartender and waiter. I really loved this job; it was in a Heritage Park and we had a lot of locals that came in and talked with us. It was also a great family environment. Davin: I kind of felt that I could achieve anything if I put my mind to it. Now I am looking forward to my next year in university. I don’t think I would have looked forward to it should I have not taken this trip. 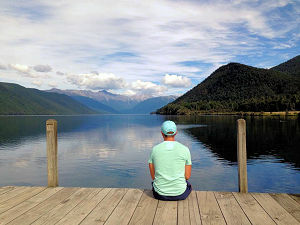 What advice would you give to someone that is about to go to New Zealand on a working holiday visa? Davin: Approach it with an open mind. I think it is super important because you will meet so many people and stumble upon so many opportunities. You have to live your trip in the present. It will be incredibly different from home. Also, picking compatible travel buddies is very important too, as I met a lot of people that were not really compatible and did not have as much fun. Last question, would you recommend getting an Arrival Pack to your friends? Davin: Yeah 100%! I really liked the personal contact. I was not part of a backpacker factory, the guys there all knew me and my name. How does the Starter Pack work?